Carpe Diem means “seize the day” and Mark Forner, WMU alumni and principal of Carpe Diem Meridian Campus in Indianapolis certainly has seized his day. With a history as a business owner, classroom teacher and passionate supporter of school reform, Dr. Forner has taken the lead in a new concept school. Carpe Diem has brought higher test scores and graduation rates to the students who populate the “blended learning” concept urban educational facility. Blended learning combines two approaches, the traditional teacher-led classroom and the online school model in which students work independently on digital courses. Carpe Diem Meridian combines high quality classroom instruction with challenging digital courses in a highly personalized way. Students are not divided into age-level grades; instead, they are allowed to work to their ability level, and may climb through the levels much faster than if they were to spend a full year in each grade. The first Carpe Diem school was established by Rick Ogston in Yuma, AZ about eight years ago. He developed the concept and Carpe Diem Yuma has had outstanding test scores and graduation rates well above the state average for Arizona. 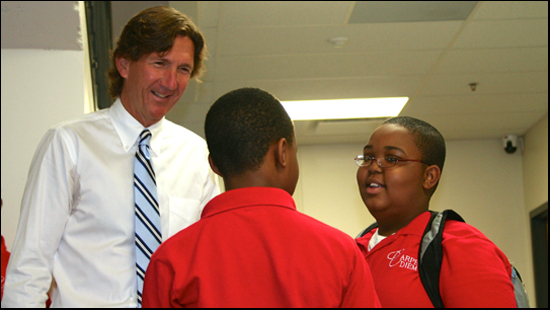 Once he had the model school up and running successfully, he expanded into Indianapolis in 2012 and now into Ohio. The Meridian Campus in Indianapolis had middle school passage rates on state standardized testing of over 85% in English and Language Arts and 88% in Math, well above the state average. Mark Forner has been instrumental in making this vision happen and he credits the education he received at Western Michigan University for helping him. After received a bachelor’s degree in Economics from Kalamazoo College and an MBA from the University of Notre Dame, Mark was a small-town business owner who ended up, almost by default, on the school board. As he became more interested in school reform, he realized he needed to expand his skills in the area of educational leadership, with the goal of becoming a rural school principal. He turned to Western’s Educational Leadership, Research and Technology program to pursue an Ed. Specialist degree, but later was able to enter the Ph.D. program in Educational Leadership. He began his program in 2007 and graduated in December 2010. When Mark Forner started his program at WMU, he felt out of place as a “very non-traditional” student. His only experience in the education field was his stint as a school board member in a small rural school district. Fortunately he connected with Dr. Louann Bierlein-Palmer and Dr. Patricia Reeves, whom he characterizes as “purveyors of hope…at a time when others expressed skepticism. Great universities are all about life-long and life-altering relationships. I count my friendships with Pat and Louann as one of the great blessings of my life ” With the help of these professors and the resources available at WMU, Mark was able to pursue his research interests in the components of successful school reform, particularly as it pertained to rural school districts. He studied the leadership practices of six highly successful rural school superintendents in Michigan for his dissertation. The Graduate College at Western Michigan University is proud to acknowledge Dr. Mark Forner as one of our graduates. His path has been long and winding, culminating in the leadership of a new type of learning environment, the blended-learning academy. Though small, with fewer than 200 students currently enrolled, Carpe Diem Meridian is well on its way to proving Dr. Forner right in his belief that school reform can create a new type of learning environment that serves today’s students better than the traditional models. 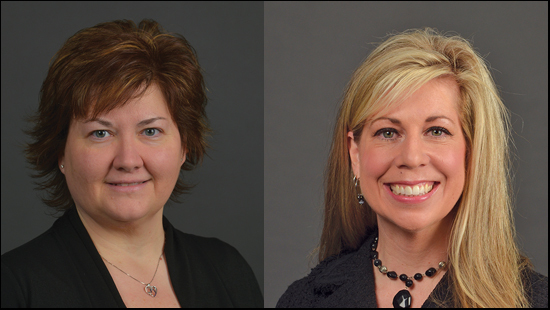 The Graduate College is excited to welcome two new employees this spring semester. Jodi Ward worked most recently as associate director of operations in the Office of Admissions before starting at the Graduate College as our systems analyst. Jodi got her bachelor’s degree from Michigan State University in psychology and obtained a Master of Arts degree in human resources development at WMU. She is currently pursuing a Ph.D. in educational leadership with a concentration in organizational analysis here at Western. Jodi started out at WMU as a college recruiter whose territory was the east side of Michigan, including Washtenaw, Hillsdale, Lower Wayne and Monroe counties. She also coordinated the Medallion competition. 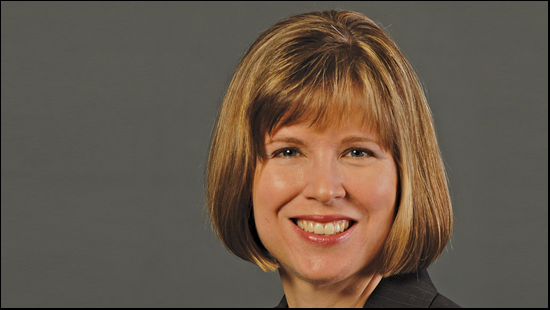 After five years she was promoted to transfer coordinator, where she managed recruitment efforts at the 28 Michigan community colleges. Most recently, she directed the processes, policies and procedures for application processing in the Office of Admissions. She has especially enjoyed the diversity of staff, faculty and students with whom she has had the privilege to work. In her new position Jodi is excited about leading the implementation of the new Apply Yourself tool for graduate applications. There is a lot of work to be done to convert to this new system but the process should be much smoother for both prospective students and functional users at WMU. Jodi spends her spare time cheering at Bronco sporting events with her husband and eight-year-old son. She attends most practices and games her son plays in, which keeps her busy, as he is involved in football, basketball, and baseball. She also likes to kayak when the weather cooperates. Angie, our new finance analyst, attended Lake Superior State University and Kalamazoo Valley Community College. She is currently working on her bachelor’s degree in general university studies. Angie began her career at Western Michigan University as an office assistant in the math department in 1999, and then transferred into the history department as an office associate in 2001. 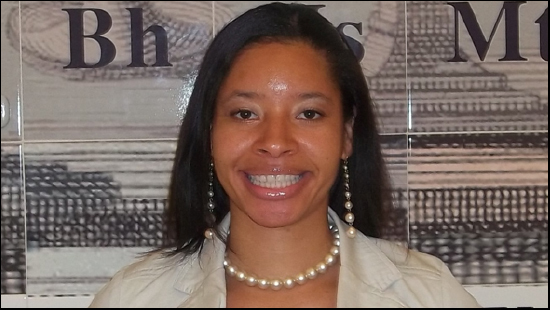 In 2002 she moved into the dean’s office of the College of Arts and Sciences to become a finance analyst. She appreciates the opportunity to form lasting relationships through working with people from across campus. As for time away from campus, Angie loves to be by the water. Lake Huron is her favorite Great Lake. She and her husband of almost 15 years, Jerry, frequently travel to Lake Michigan to enjoy sunsets and the incredible ice formations in winter. She likes to entertain her friends and family with bonfires in the backyard, and camping is on her list of favorite activities. She has three daughters, ages 22, 20 and 18, and a beautiful baby grandson. Angie’s new position as finance analyst involves working closely with Virginia Bowlby, coordinator of graduate appointments. As she adjusts to life in a new environment she looks forward to working with the staff and students of the Graduate College. It is a team-oriented office where she can use her talents and help where she is needed. We are all glad to welcome both Angie and Jodi to our staff, where they are much appreciated for their expertise and hard work as well as their fun personalities. This Spring Break a group of graduate students from the Graduate Student Advisory Committee traveled to Washington D.C. to meet with National Association of Graduate and Professional Students (NAGPS). They joined forces to lobby for issues of concern to graduate students, mainly the high levels of debt many graduate students accumulate while pursuing their degrees. They met with representatives and senators to express their concerns during the NAGPS Spring 2014 Advocacy Summit and Legislative Action Days, March 1 through 4. In other news, GSAC has put to a vote of the full membership a name change for the organization. In order to better reflect its constituency, the Graduate Student Advisory Committee will change its name to Graduate Student Association. All graduate students are automatically members of GSAC, or GSA. The name change will become effective July 1, 2014. Each student pays fees to the University that go toward the operation and funding of a number of initiatives to benefit graduate students. These initiatives include programs, events, operational funding, development workshops or seminars, and bringing speakers to campus. Funding decisions are made through GSAC, so if any graduate students want to be involved in how their money is being spent, they are encouraged to come to the meetings. All graduate students are urged to become active members by attending meetings which are usually held once a month on the third Friday from 2:30-5 p.m. These hours are subject to change. Another initiative led by Damon Chambers, Chair, and The E-Board, is the establishment of Grad Talks, a presentation hosted by the Lee Honors College based on the popular TED Talks. 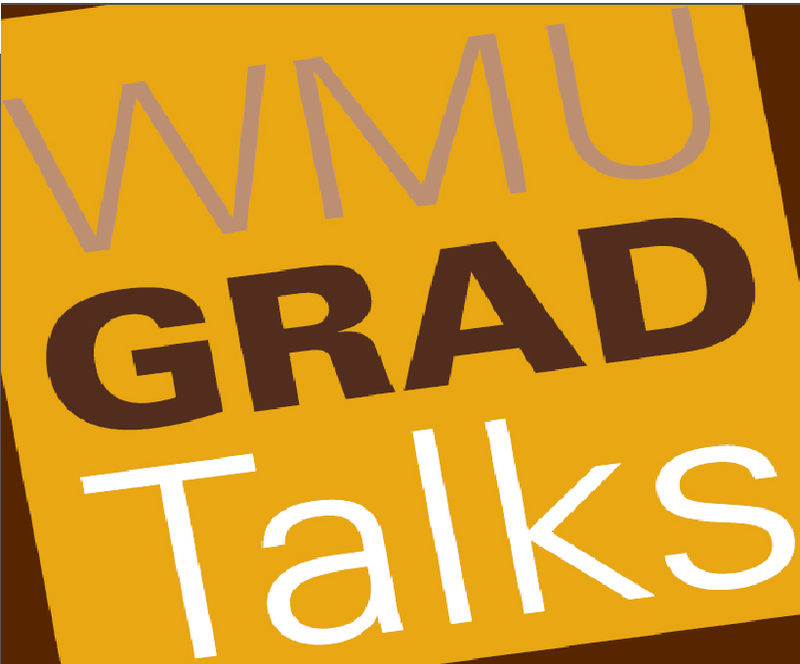 The first Grad Talks were held on February 21 and March 21. These are ten minute talks given by graduate students on any subject they may be passionate about. It could be a study abroad experience, a brief introduction to their research, the contents of a recent paper for a class or a chapter of their dissertation. This experience provides practice in giving presentations, a skill all graduate students must develop to meet their academic, professional or personal goals. April 6 through 12 was Graduate Appreciation Week in the United States. The National Association of Graduate and Professional Students held its Midwest Regional Conference at Grand Valley State University this spring during Graduate Appreciation Week. This annual conference brings together graduate-professional student leaders from the Midwest region to network, share best practices, discuss common issues, and brainstorm possible solutions. Representatives from WMU attended this conference and reported a good turnout and useful workshops.